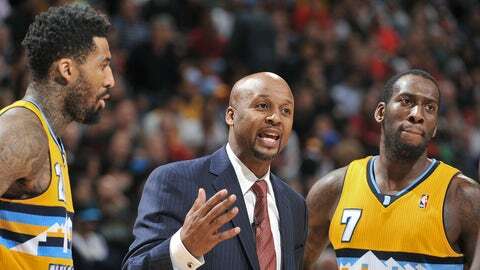 Nuggets head coach Brian Shaw hasn’t had a nightmare start of the season like some other rookie head coaches, but when a coach is willing to stand under a basket ready to get hit with a ball just so his team will make free throws, you know he’s been frustrated. Even though Denver got a win Monday night against Washington, they only won 75-74. That’s just pedestrian ball and nothing to be proud of. Not only did they post a season-low in points but they also added in 22 sloppy turnovers. Somehow, they still managed to slip out of there with a win. "We missed a lot of open shots. They missed a lot of open shots. I don’t know. It was just terrible basketball," Nuggets power forward Kenneth Faried said. "But it’s like that sometimes. We came out with the win, so we’ll take it." While they’re off to a 14-8 start, Shaw knows that wins like that — they scored just 18 points in the first quarter against Washington — won’t cut it if they plan on doing anything special this season. Shaw has been trying to find answers as to why his guys are playing as if they just woke up. Well when he walked through the locker room last week and saw the team chowing down on pizza and nachos he figured the poor diet was the reason and threw it all out. Well … unless that pizza was still in their system on Monday, the diet didn’t work because even after eating salads and cold cut sandwiches before playing the Wizards, these guys still played sluggish and sloppy. Maybe Shaw should get his celebrity chef wife to make some wellness meals. "We’ll keep searching and seeking until we find (it)," Shaw said. "We just talk about the starters needing to start the game for us. Our bench has been tremendous really this whole season. They’ve bailed us out of a lot of situations." Nate Robinson led the reserves with 16 points to bail the starters out once again on Monday, but don’t count on that for the whole season and then the playoffs. What else does coach Shaw have to do in order for these guys to play like pros? Take away sleeping privileges?